Green Terrace is located approximately half way up the Mt. Ikoma on the Nara side and south of Hozanji. 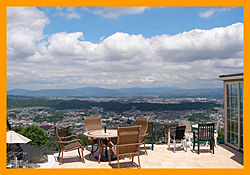 It has a magnificent panoramic overview of Ikoma and Nara cities. They are proud to create delicate cuisine that uses local organic vegetables and is absolutely 100% free of artificial food additives or seasonings. Kintetsu Nara line from Ikoma station: 11minutes by bus then 6min. on foot. From Hozanji Station of cable car, 15minutes on foot. 5car spaces available. Please confirm by booking.